Matthew and Angela were immigrants from Italy. Who migrated to New York carrying the Family business and moving it to the Jersey Shore. 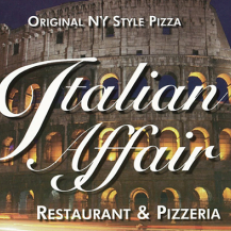 Italian Affair offers Authentic Old World Cooking and provides a large selection of pasta dishes including: Chicken, Veal, Seafood, and New York Style Thin Crust Pizza. Our sauces, pizza dough, and dinner rolls are made fresh daily and our cooks work hard to prepare every dish from scratch. Some of our specialties include: Shrimp and Scallop Scampi, Chicken Antonio, Zuppa Di Pesce, Shrimp and Crab Meat over pasta, our Famous Mussels Marinara and MORE! We are also a Family place with a casual atmosphere. We also have a special children's menu. Open Year Round and located in the ACME Bayshore Mall. Don't forget BYOB!